When they started putting those bolt on plastic fender flares on trucks in the US I thought they were ugly. Sure, bolt a bunch of plastic carp on my vehicle, nice. But here I'm thinking they might be a good idea. First, They ward off other vehicles a little. The vehicle looks a little wider partly because it is and partly I think psychologically like the hair standing up on a dog. Either way, vehicles stay a little farther from the expensive metal parts. Secondly it's a lot cheaper to replace a plastic flare than repair/paint a metal fender. So, I'm thinking to get a set but I think they'look stupid without wider wheels/tires so I'll have to save up for that too. 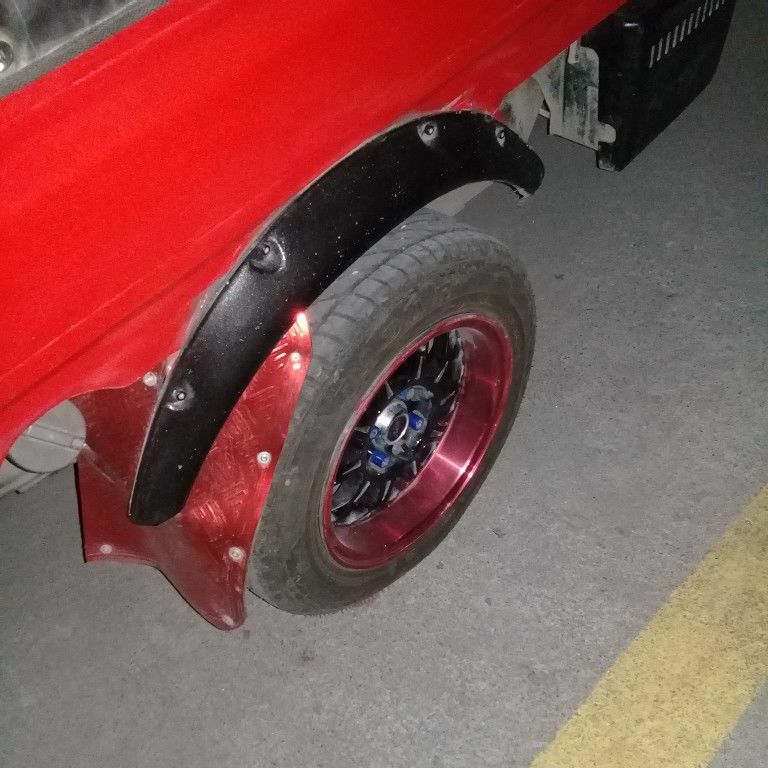 Those are pretty flimsy excuses to allow you to put new wheels and fat tires on your truck. Actually, I don't want the big off road (loud) tires. But I'll be looking at bigger street tires. Original tires were rather narrow - replaced with wider ones but they stuck outside of body and threw mud all over the place. Had some made and installed - rears are 1 piece but fronts are cut to accommodate doors.